There is already a question about seeing two sides of Iguazu but what about all three? What is the minimal number of border crossings required to visit all 3 sides of Iguazu? Would a cycle Brazil->Argentina->Paraguay->Brazil be possible or does one have to backtrack to see all sides. Which border crossing and direction requires a Canadian to get a visa? I already have a Brazil visa but not for Argentina or Paraguay, so if there is a direction in which no visa (or fewer) would be required, it would be better. The most common way to arrive is across the Puente de la Amistad (Friendship Bridge) which connects Ciudad del Este in Paraguay and Foz do Iguaçu in Brazil. There are frequent bus connections, also to and from Puerto Iguazú in Argentina. Taxis sometimes do the trans-border trip as well. A couple of km south of Ciudad del Este, where Rio Paraná and Rio Iguaçu join, is a ferry crossing to Puerto Iguazú in Argentina without crossing Brazilian territory. The ferry runs hourly during daylight hours for AR$5. There's a bus to Ciudad del Este passing close-by. From the centre (Av. General Bernardino Caballero), take a bus labeled Tres Fronteras (destination, not the company name) and ask to be dropped at la balsa (the ferry). Both countries have immigration facilities on their respective side of the river, so the ferry can be used not only for day tours but also for official border crossings. It therefore appears that it is possible to cross the Brazil–Argentina border and the Brazil–Paraguay border via road, and that the ferry can be used to cross the Argentina–Paraguay border. So a loop is in principle possible, assuming that you have the appropriate travel documents for all three countries. You can't actually cross at the falls, so you would have to backtrack, twice, anyway. The total distance would come down to about 100km. See screenshot of the route. I'm quite sure the ferry between Argentina and Paraguay runs from within the town of Foz to the tri-border point on the Paraguayan side. If you zoom in on the Google Map, you can see what are probably the ports on both sides. Apparently, Canadians don't need a visa for Argentina. Canadians do need a tourist visa for Paraguay. Not the answer you're looking for? Browse other questions tagged brazil argentina paraguay iguazu-falls or ask your own question. How to stay in Brazil for 5 months with a (tourist) visa? 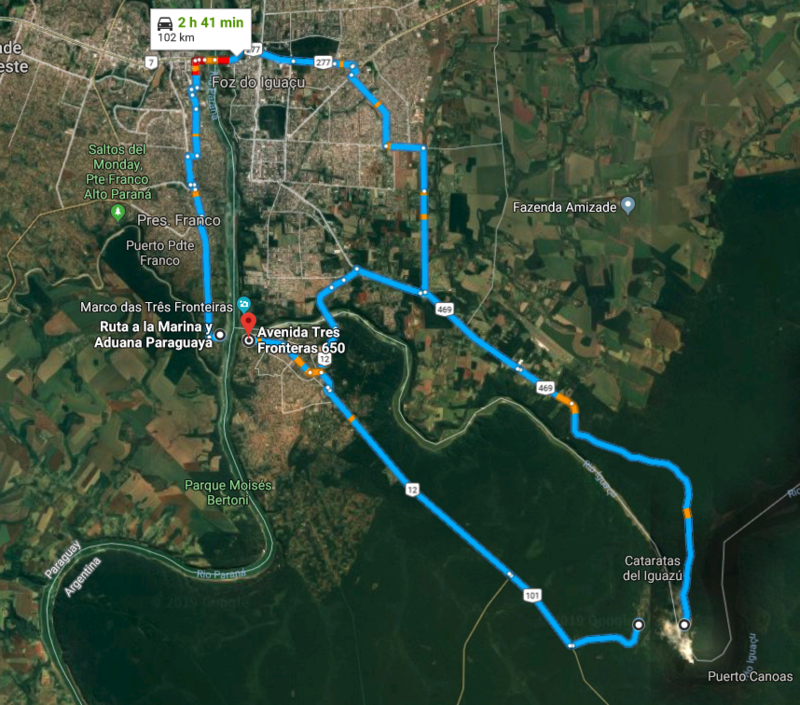 Easiest way to get to Paraguay from Puerto Iguazu? How long does it take to cross the border at Iguazu Falls? What are the pros and cons of visiting the Iguazu Falls from the Argentinian side or Brazilian side only? Can I obtain a visa for Brazil at a land crossing? Is an Australian required to fly in and out of Brazil to activate a tourist visa?